I had the good fortune to be staying just around the corner from Melbourne’s Chinatown so on evenings when I felt almost immovably lazy I had the prospect of dumplings close at hand. 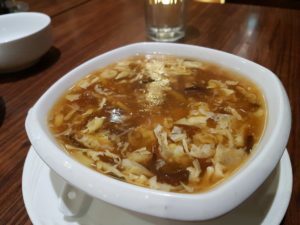 On one such evening I dragged my sleepy self to a place where I’d seen them hand-crafting dumplings earlier that day for a quick late evening bite. Called Ta Ta House, I found it sparsely populated to begin with, but it soon became quite busy with people stopping in for snacks to conclude proceedings on a quiet weeknight. I was keen to try their dumplings so ordered the pan-fried homemade pork buns. I added some shredded duck and dried scallop soup to start and a plate of kway teow as a main. The soup arrived first and was really good. It had great depth of flavour, good shredded bits and bobs through the soup and was a very satisfying eat. Next the buns arrived. 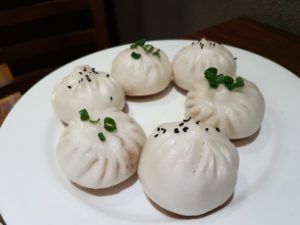 These were hearty beasties with outstandingly flavourful pork mince in delicious broth, with the bun casings light and fresh with a good crisp underside. 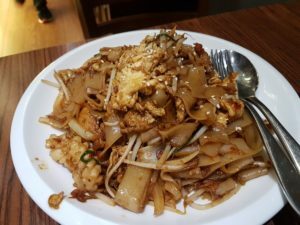 I’d ordered the kway teow more out of curiosity than anything else as it was one of the dishes I’d sampled at one of the Singapore hawker markets. Gone were the traditional clams, replaced by squid and prawns, but this was otherwise quite similar to what I’d sampled at Zion Street. It was an enjoyable plate of noodle goodness. So overall, Ta Ta House served me three very good dishes. I imagine I’ll be popping round to other Chinatown places for evening treats as much of my planned fancy dining in Melbourne is at lunchtime. I’d be happy to visit Ta Ta again for more of their hand-crafted dumplings.